Keeping pace with latest technology, we supply and export Single and Double Distiller, Quartz Water Distiller for the solution of laboratory needs of diverse sectors. 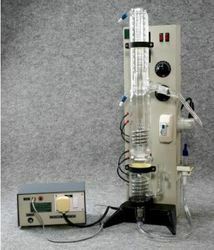 Very easy to handle and shift, our Laboratory Water Distiller is available in compact design and portable model. The electrical heaters are meticulously designed for safe operation and power saving. We are committed to deliver high quality water distillers to render the clients optimal satisfaction. In the All Quartz Double Distillation QDD-SH Series the components coming into contact with water are quartz glass parts which,contrary to ordinary laboratory glass are non-hygroscopic and thus resistant to H20. These properties warrant the high purity requirement a distillate must fulfill. Fail safe devices like solenoid valve avoids cold water wastage during power failure, the optimization of cooling watervolume is controlled by a cooling water flow meter, in addition to this the equipment is fitted with PTS which maintains sufficient water to the boiler. In the All Quartz Double Distillation, the components coming into contact with water are quartz glass parts which, contrary to ordinary laboratory glass are non-hygroscopic and thus resistant to H20. These properties warrant the high purity requirement a distillate must fulfill.. 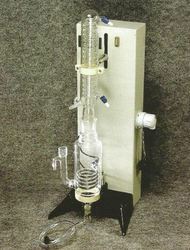 High-quality electronic-grade quartz is used in the fabrication of this apparatus. This range of quartz double distiller provides answers to ultra pure water for research and bio- technological requirements. 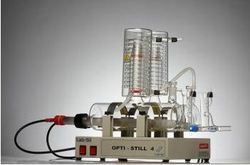 All Quartz construction with silica heater ensures high purity PYROGEN Free distilled water . 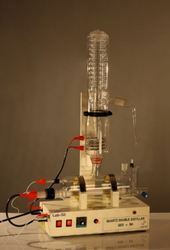 Looking for Quartz Water Stills ?